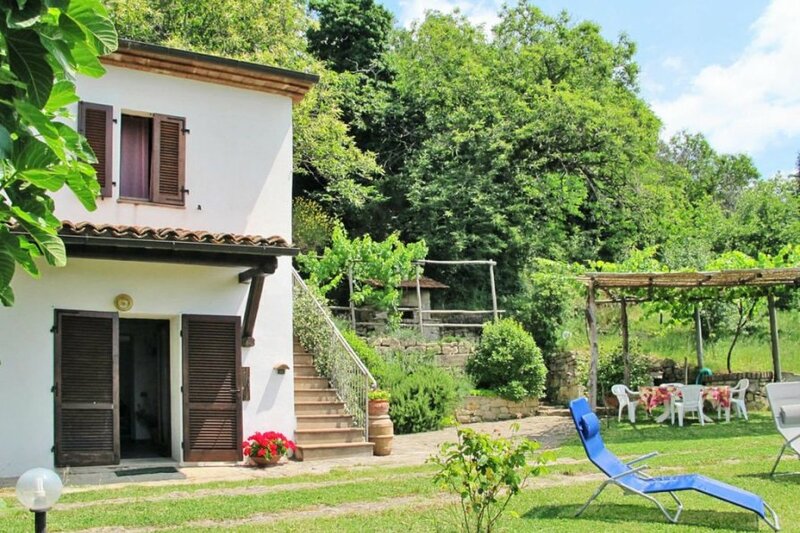 This 2 bedroom villa is located in Roccastrada and sleeps 6 people. It has barbeque facilities. The villa is near a beach. Detached house, 4 - 6 people, 4 room/s, 2 bedroom/s, 2 bathroom/s, approximately 80 m², 2 floor/s. Furnishing: rustic, good, tiled floor. Equipment: satellite TV; washing machine. Electricity according to consumption approximately € 0.40/​kWh. Fire wood according to consumption approximately € 15/​100 kg. Linen/towels available. Change of bed linen/​towels every 7 days included. Deposit € 250 (in cash). Cot € 30 per stay (on order). Pet not allowed. Situation: sea view, view of Monte Argentario. Access/parking: gravel road, approximately 300 m.
Estate (shared use): approximately 1.2 ha, partially self-contained, in a hillside, trees, meadow, fruit trees, olive trees. Garden maintenance by the owner. Outdoor facilities(private use): reserved open space (pergola), furnishing provided, brick barbecue, pizza oven. The villa is described as good value for money. This villa is located in Roccastrada. The nearest airport is 130km away. It is set in a very convenient location, 45km away from a beach and only 700 metres away from the city center. The villa is adequately equipped: it has a dishwasher and a washing machine. It also has a BBQ. There is a golf course nearby. The villa is suitable for family friendly summer holidays.